Pete and Jen's Backyard Birds - Moving to Codman Community Farm in Lincoln! We are happy to announce we will be moving our farm to Codman Community Farm (CCF) in Lincoln as of January 1, 2016. Our "official" letter to our customers is below. A statement from CCF will be released this week. More info to come! We wish all of you a happy holiday season and thank you all for your support this year on our long and winding journey as we searched for a new farm and home. 2015 has been the "year of opportunity" and we've explored many options far and wide with creative ideas, open minds, and dozens of emotional roller coasters just to keep life interesting! in Lincoln, MA. We couldn't be more excited to stay in the 'hood (exactly 3.5 miles from our current location) and to be warmly welcomed by the Codman Community Farms nonprofit board and the greater Lincoln community! We owe a debt of gratitude to so many individuals who have supported us this year and in particular to those who have been actively recruiting us to Lincoln and to Codman Community Farm - we feel extremely supported and welcomed (we will be writing our full 2015 "blog of gratitude" soon). We are also exceptionally grateful to all of you who kept encouraging us, keeping our spirits up, and sharing the faith that something wonderful would work out. You all kept sending us your thoughts, best wishes, ideas, and strategies to keep us in the area - and it worked! 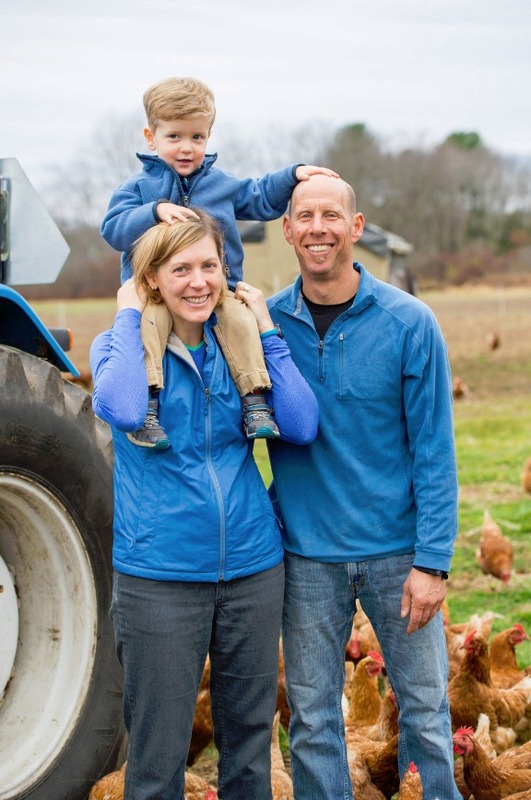 We are really looking forward to this next chapter in our farm careers and to keep providing you with the highest quality, pasture-raised and organic meats, eggs, veggies, and fruits so close to Boston. With much gratitude to all! We will be making our transition next week with our official "move date" of December 29th and 30th and Pete's official start as the new Farm Manager of Codman will begin January 1. Look for all of our mini-store goodies (plenty of pork, chicken, fresh eggs, rabbit, beef, and more) at the Codman Farm Store (58 Codman Road, Lincoln, MA) starting on January 1st (feel free to continue to shop at the mini-store in Sudburythrough the end of the year for all of your holiday goodies!). Photo credit: Angela Klempnerwith Codman Community Farms to steward over 100 acres of public and private farmland throughout Lincoln. We are also excited to finally be farming with access to real farm infrastructure - barns for storage, barns for brooding chicks, barns for breeding animals, and endless fields and pasture - it will be amazing! The farm house is right on the property next to the barn, so we'll be living close to all the action. We are eager to learn about managing a high-quality herd of heritage-breed grass-fed Red Devon cattle and the timeless process of making hay - we have a lot to learn and we look forward to introducing the residents of Lincoln to our "mobile fleet" of critters to spread all that natural fertility and improve the productivity of the fields. Our innovative management intensive grazing systems will complement the educational mission of Codman, so we hope you will follow our progress through the fields, join us on community volunteer days, attend fun social events at the Codman barn, and more as we grow the farm operations and help expand the educational mission of the farm. We look forward to an exciting and adventurous new year and we hope you will join us by continuing to enjoy all our delicious and super tasty products! Thank you so much again for continuing to support us and we look forward to seeing you all soon either at the farm here or at Codman in the New Year. Join us this winter on Saturdays from 10-2 at the Wayland Winter Farmers Market at Russell's Garden Center starting on January 9th. Photo credit: Angela Klempner ones, and of course, delicious, locally grown food! Bring on the New Year! PS - and check out our new pork products - fresh from the German Smokehouse in Connecticut. Our delicious heritage breed, pasture-raised pork have been transformed into delicious knockwurst, ring bologna, smoked kelly dogs (kielbasa hot dogs), double-smoked nitrite-free bacon, and more! Visit the mini-store and stock up for winter! Tasty, tasty pork, eggs, chicken, rabbit, and more!